The club comes straight to you in one of the most rewarding online bingo sites to come around in quite some time. Bingo Clubhouse won’t leave you feeling deprived with rewards and benefits that outmatch any local bingo hall and out challenges them all. It is a Clubhouse you will be a proud member of. First impressions mean a lot and can either make or break any online bingo site. Bingo Clubhouse makes the grade with an A+ for modern sleek web design that is most inviting at first glance. Lavished in purples and pinks, the site represents a cozy haven with the comfy cottage logo where players can congregate and play. There are tremendous rewards offering more perks than you can even imagine rolled into one nice spot. The Rewards Shop is where you can purchase items with your Rewards Card. Items including a spin on the Bingo Clubhouse Wheel, Odeon Cinema tickets, Bonus Cash and more are available. The site is under the umbrella of 15 Network; a growing bingo company in the industry. Games are powered by Jumpman Gaming Limited software offering a platform of products that truly a new experience for players. Registered and licensed in Alderney assures players of the integrity of Bingo Clubhouse. With just a few brands at the moment offering these products players will indulge in an experience of gaming like no other. The two top Bingo favorites made popular by players are available; 90 ball and 75 ball bingo. The Chat Mod will be on hand to welcome you and entertain you with fun Chat Games. The Chat allows players to add friends new and old on a buddy list creating strong bingo community of players. Team Bingo and Team Slots are offered two times a week with amazing cash prizes up for grabs to the winning teams. Play Team Bingo on Tuesday and Saturday and Team Slots on Monday and Thursdays. The Lucky Lotto Game every Wednesday has massive Jackpots. To participate, pick 3 numbers under B 1-18 and the first player whose numbers are drawn and win a massive Jackpot. The Slot games are one of a kind with vibrant graphics, riveting animation and Bonus Games on select machines. Other games include Instant Games, Scratch Cards, Roulette and Blackjack. Besides the initial Welcome Bonus after joining and Re-Deposit Bonuses on all other transactions, Bingo Clubhouse has one of the most robust reward incentives around. For starters players will earn Bingo Coins every time they partake in promotional offer, games and more. These coins can be used to purchase amazing gifts as well as move you up the VIP ladder where there are exclusive Bonuses and promotions that get better every level you move up. Bingo Coins are not the only thing you will earn because Loyalty Points are available too and add up quickly the more you play. Loyalty Points can be converted into Bonus Cash where you can play your favorite games. Every month you will you have a chance to win great gifts in the Monthly Member Prize draw. Every day of the week including weekends offer Jackpot promotions and specials including Monday Madness and Friday Jackpots even Friday Night Free Takeaway. Most bingo sites will offer one rewards program, but at Bingo Clubhouse there are many and this is one of the highlights of playing here. Combine that will a unique platform of Slots and fresh new promotions and you have a site worth remembering. We rate Bingo Clubhouse with 4 Pink Hearts. I joined and got the bingo rewards card straight away. 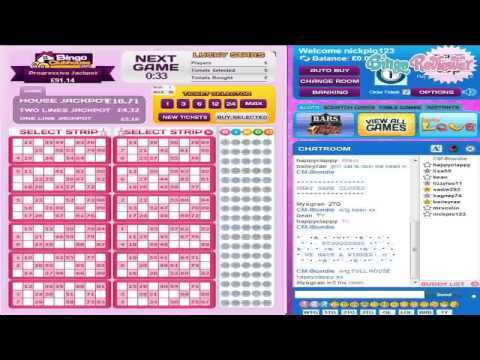 The bingo rooms are not too crowded although i think that will change because they are a new bingo site. Love this site! been playing here since it opened and love the rewards idea! loads of friendly players who are all new and i can see this site getting very popular! bingo clubhouse is my new favourite site! I joined when it opened and i love my bingo rewards card, i love that you can enter promos for free instead of having to buy tickets! Although the banner might make you think it's one of those no deposit bonuses for new players, you do have to make a £10 deposit first, in order to get a £20 bonus (it's a classic 200% sign up depositing bonus). Also, when you register, you get a free spin of the wheel with a chance to win up to £2,500 and although I won close to nothing (just like I expected). What I did like was the Bingo Reward program, which is something like cash back, since you collect reward points for every game you play (regardless if you win or lose). You can collect various prizes with those points, and it is a nice way of getting something back. They offer only 75 and 90 ball games, along with nice chat games that I found really interesting, and actually even won for a few times. I wish, however, that they do get some other bingo variants since I like the 30 ball bingo and the 5 line variant.